There are many different trends in interior design popping up. Accent walls are becoming very popular. An accent wall is usually a different color from the rest of the room. It is mean to give a pop of color and dimension to the space. It draws the eye to that space. A great color option for an accent wall would be black. Painting a wall black is easier than it sounds. Lighter colors take more work and applications to cover other colors. Black paint does not require as many coats to cover the previous colors on any surface. 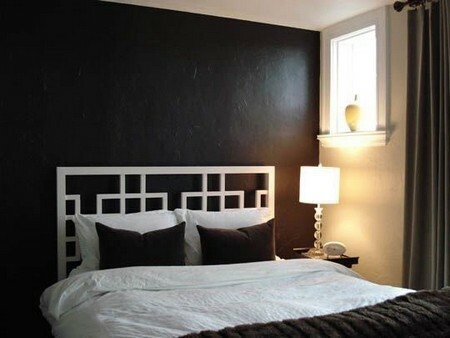 There are some guidelines you should keep in mind when painting a wall black. The following suggestions will guarantee your wall comes out looking great and like it was done by a professional. With the exception of the additional price attached to to using a professional. Make sure your work surface is clean. Wash down the wall you intend to make your accent wall. Use a damp cloth and a mild soap if needed. Remove all dirt, dust and debris so that your paint bonds to the wall surface without interference. Apply black primer to the wall. You will need to place the primer where the wall meets the ceiling. Primer ensures that the paint sticks to the walls surface. Paint all the edges of the wall before moving on. Paint in smooth, thin layers. You want to make sure the primer layers are not thick. If you put too much on, after the layer dies, the edges will be thicker than the other parts of the wall. Use a roller to apply the primer onto the wall. Apply the primer in the shape of a ‘w’. Make sure the strokes are even for the best results. With the first pass paint a ‘w’ on the surface. With the next pass, fill in the gaps with the black primer. Continue in this way until the entire wall is primed and ready. Allow the wall surface to dry for at least at two to three hours for drying time. After the paint is dry, you can start to apply the black paint. You should apply your black paint in the same manner that you applied your black paint primer. Start with the outside edged first. Allow the first layer to dry. Apply a second layer on paint. Stand back and look at your wall. Look for any surface showing through or thin areas. Touch up any missed areas using a paintbrush.